In 1995 a friend asked Richard Ross to help her blow glass when her assistants failed show up at San Francisco State University. 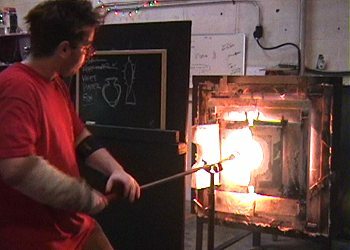 This was the first time Richard touched a blow pipe to molten glass and he took to the process like a fish to water. Soon after enrolling in the S.F.S.U. glass program, Richard was awarded a scholarship to Pilchuck Glass School where he attended an intensive training program taught by Randy Walker. He later served as a Teaching Assistant at Pilchuck for Einar and Jamex De La Torre. Richard also studied at the Studio at the Corning Museum of Glass under Jack Wax and Mark Petrovic. Besides training sessions at renown glass institutions, Richard has also worked with such notable glass artists as John Leighton, Jeremy Cline, Joe Caraiti, the Bay Area Glass Institute and Mexico's Jaime and Einar De La Torre. Richard says that "Glass is the only medium in which I can make a piece exactly as I see it in my head". His attraction to graceful curves, and clean, flowing lines is evident in his simple, primal forms and bold color usage, while his tongue in cheek humor is evident in his sculptural work. Richard imagines his sculptural glass and mixed media work "are what archeologists would find if they excavated the laboratory and storage rooms of a Scientist from the 1880's or 1920's". In 1997 Richard founded and built a Glass Blowing Studio in Alameda CA. In 1999, Richard sold his interest in the studio, to persue artistic persuits. He now blows glass in Oakland CA, at Charlie Jenkins glass studio, which he helped design and build. I imagine my sculptural glass and mixed media works are what archeologists would find if they excavated the laboratory and storage facility of a Scientist from the1930's. Much of my work might have been created for a specific alchemical purpose: to transform an element, awaken a god, or restore to life some extinct species or person. For my work, I draw from my life interests - early science, ancient gods, the natural world, and slightly odd sense of humor. One aspect of my work that seems to stand out for many people is my bold color usage. I use the term bold somewhat facetiously. Being partially color blind, I have learned to trust my own eyes, and use colors that appeal to me, and I am told that these choices seem strangely striking to people with normal color vision. In my opinion, glass is the perfect medium. Before I begin working, I need to have completed both the image, and the process of creating that image in my head. I often drift to sleep trying to envision a way to create a particular shape, only to wake with the details of the process completed by my dreaming subconscious. The process of blowing and sculpting glass is immediate; there is nothing between you and the 2000 degree material but a piece of wet newspaper or a slim metal tool. Once the glass is touched it "remembers" what has been done to it, so it pays to do it right the first time. I enjoy working the glass, because the process necessitates the use of my entire body, the full focus of my mind, and because glass is the only medium in which I can make produce a work exactly as I see it in my head. Teaching Assistant, John Leighton, San Francisco State University, SF, CA. 1997 Teaching Assistant, John Leighton, San Francisco State University, SF, CA.